Here are you plans for August 3. 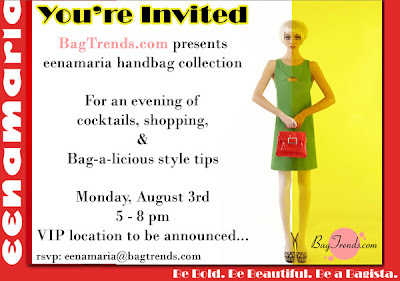 BagTrends.com presents Eenamaria handbag collection. Enjoy an evening of cocktails, shopping, & Bag-a-licious style tips. In the meantime, Get To Know Eenamaria's designer Sarah Morgan.